We also need to learn how to get other people excited to hear more about our services and our offerings because that is how we can actually be of service and change people’s lives. The best way to create excitement about, dare I say, you and your services is to position yourself as an authority in your niche who’s willing to share your valuable insight with people. I suggest emailing magazine editors, podcasters, and industry bloggers and pitching them a story that benefits their audience (who also happens to be your ideal client.) Offer your time and insight as a value to their content creation process. Find ways to share your unique perspective and experience with their audience to extend your business reach. The more people who discover your valuable insight, the easier it’ll be to point them back to your practice. 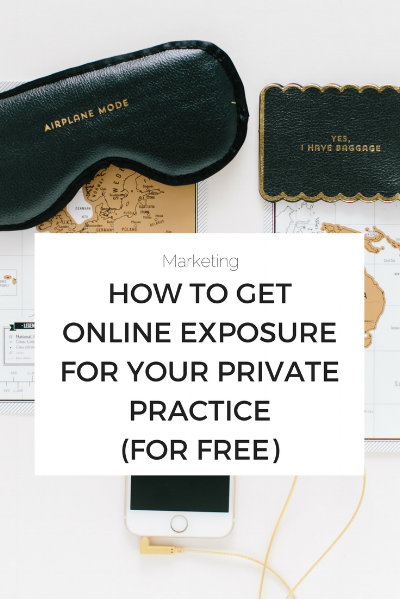 If you have questions or need help brainstorming your marketing plan, sign up for your free 20 minute Private Practice consultation here!